Serious Request is a major charity event which takes place in the Netherlands every December. It sees a team of 3 DJs have themselves locked into a glass studio for a week, playing non-stop requests 24/7 to raise money for a good cause – each request being accompanied by a donation from the person making it. In 2015, Serious Request is raising money for the International Red Cross to help give a better future to children and young people living in some of the world’s war zones. And the event restricted to the physical world. For the last few years Dutch DJs with a foot in Second Life have been supporting Serious Request by playing tunes in-world in return for donations in Linden Dollars, and 2015 is no exception. Running through until Sunday, December 20th, Serious Request Second Life is now under way. Taking place at a specially constructed event space in-world, Serious Request SL offers everyone a chance to enjoy great music across all genres and languages, dance, and pick-up special promotional items. Above all, you can use your requests to help raise money for the International Red Cross in their efforts to provide support and assistance to children and young people trying to survive under the most extreme conditions in Syria, South Sudan, the Central African Republic and the Democratic Republic of Congo. Donations can be made with requests at the event, or donations can be made through any of the distinctive orange donation boxes (shown right). You can find out more on the Serious Request SL website, which includes a live running total of the amount raised, a stream of the event so you can listen while not logged-in to Second Life. If you prefer, you can use the website to obtain the iOS or Android app for Nieuwland FM, allowing you to listen to Serious Request while on the move. Supported by a range of brands and content creators providing sponsorship, and featuring clubs and shops from across SL as active participants, Serious Request Second Life offers something for everyone. So – why not go Dutch this week and help raise money for an international cause? Update: As per the comment from AI Austin below, those who have previously purchased Pocket Metaverse can currently still update the the latest version / obtain a replacement version through iTunes. Pocket Metaverse has been a text-based client available for iPad and iPhone users to access Second Life and engage with friends through chat and IM, manage inventory, teleport, make payments, etc. It was last updated on September 8th, 2015, ostensibly providing compatibility with iOS 9, although in the process, this appeared to break support for iOS 7 and 8. 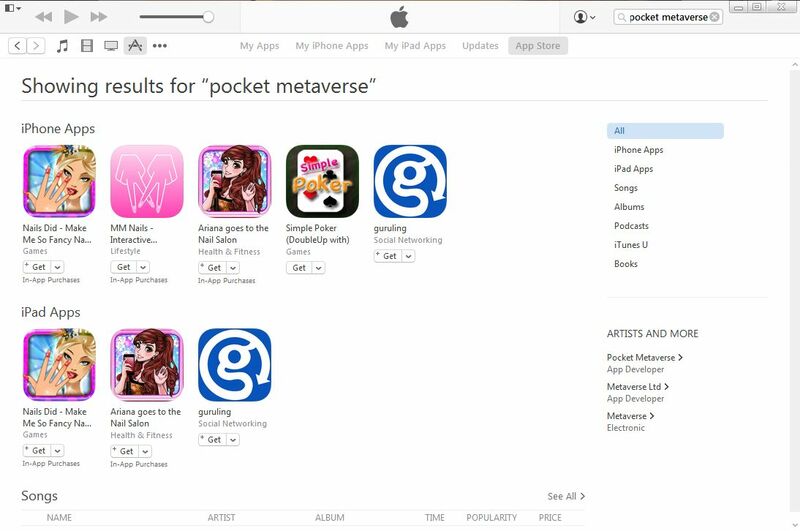 During November the download page for Pocket Metaverse vanished from Apple’s app listings on the iTunes store and so is no longer available to those wishing to download it for the first time, a fact more widely noted earlier in December. While the dedicated web site for the application remains live, searches of iTunes still fail to yield any results. While the application may have vanished from iTunes, I understand existing versions are still working in-world (with the possible issue of version 1.9.4 not supporting iOS 7 or 8); however, as I am not an Apple user, I cannot verify this. I’ve attempted to contact the developer of Pocket Metaverse, Edward Magic, both in-world and via e-mail during the last couple of weeks, to try to ascertain news on the application’s overall status, but have yet to receive any response (Edward doesn’t appear to have logged-in to SL since June 2013, although as noted, the application has continued to be updated through until September 2015). Should I receive a response I will update this article. Cool VL Viewer updated as follows: Stable version to 1.26.16.3 and Experimental branch to 1.26.17.1, both on December 12th (release notes). On Sunday, December 13th, 2015, the Grand Finale of the University Of Western Australia’s (UWA) Pursue Impossible was held at the impressive UWA-BOSL Grand Amphitheatre. During the event, over L$500,000 was awarded in prizes to artists, machinima makers and those who took part in the audience participation competitions. The last in an impressive line of grand challenges organised under the umbrella of the UWA, the event was a very special celebration of artistic expression in Second Life. Pursue Impossible took its theme from the UWA’s clarion call to students in the physical world to achieve their fullest possible potential by studying with the university. For artists and machinima makers it sought to have them consider what their “impossible” might be – personal, part of their lives or those they know, or a consideration of the things we deem to be impossible, but which yet be overcome, or illustrations of how the virtual encourages us to reach beyond the possible, etc. The Grand Finale was hosted by the UWA’s Jayjay Zifanwe, with the UWA’s art curator, FreeWee Ling also on hand to announce the special Curator’s awards in both the art and machinima categories. 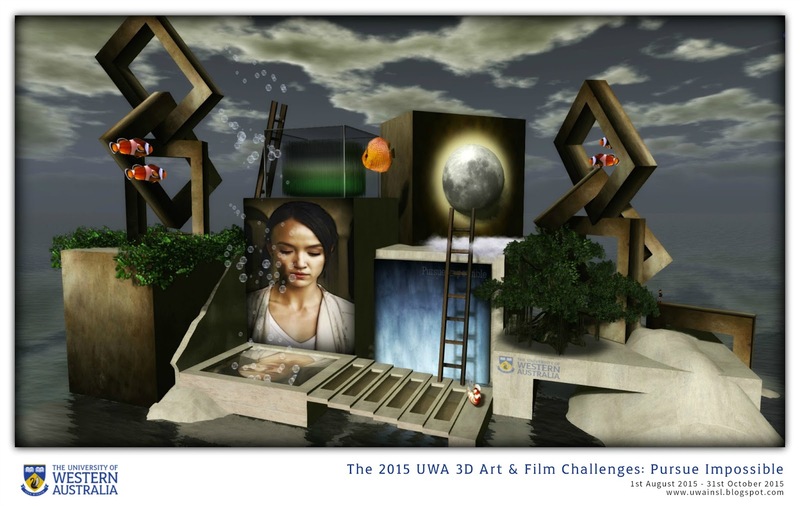 Today brings to an end the 6th year of the major art challenges at UWA, with 59 artworks by 61 different artists (2 entries were collaborations) in the running for the 3D Art Challenge and 43 machinima for MachinimUWA VIII: PURSUE IMPOSSIBLE. As announced on the web previously, this winners ceremony also marks the end of the yearly cycles of major art and film challenges at UWA. UWA still remains, the UWA Art Gallery still remains, and is in fact renewed, as FreeWee will take the helm fully when it comes to art, without me meddling, and we have a new partner for art as well, as the Main UWA Gallery will be renamed the Windlight-UWA Gallery as Windlight Magazine will be providing support for the art initiatives that FreeWee will run in 2016. Much thanks to Johannes1977 for helping to make this happen. It’s been an absolute pleasure for me to work with all of you over the course of these challenges, and over the years, and especially to those who went above and beyond the call of duty to make all of this a success. Thank you FreeWee Ling, curator of art at UWA & RL Honorary Fellow at UWA. Thank you LaPiscean Liberty, co-host for MachinimUWA VIII, champion of machinima of Second Life. Also much thanks to those who have provided support and sponsorship which sees the overall prize pool standing at more than L$500,000 across both art and machinima. There was a total prize pool of L$82,000 for the audience participation challenge, split equally between the 3D art and machinima categories. This saw members of the public invited to submit invited to what they thought the top 10 items in either or both of the categories would be, as decided by the Pursue Impossible adjudicating panel. In all 5 cash prizes were on offer, ranging from L$5,000 to L$12,000 in each category. Note that SLurls are given with the titles of all winning pieces, and all the entries into the Pursue Impossible 3D art challenge can still be viewed at the UWA art gallery. Due to a 5th place tie, there was no award for sixth place.